Adding to an already sprawling offering of iOS creativity apps, Adobe on Thursday released Post, a tool that helps users turn photos, text and graphics into striking visuals for sharing through social media outlets like Instagram. Adobe Post is positioned as a social media solution for small business owners looking to create impactful online campaigns with minimal overhead. With a set of curated templates, intuitive text overlay tools, thematic color options and more, the iOS-only app comes loaded for bear. 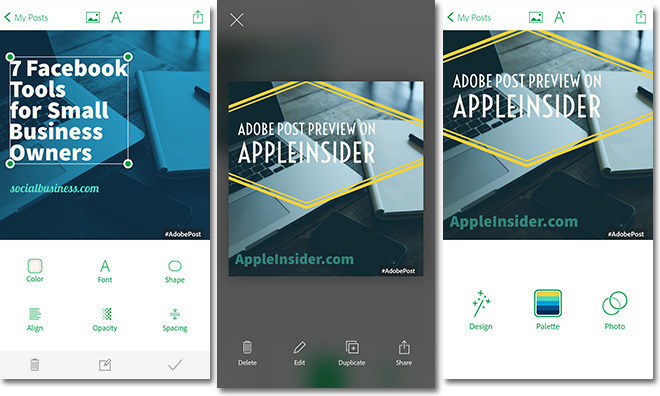 Adobe principal product manager Thibault Imbert told AppleInsider that Post was created to empower everyday users, no design experience required. The app does most of the heavy lifting, like text resizing and adjustments, color scheme matching and other technical work usually the concern of a graphic designer. To get started, Post includes an Inspiration Wall filled with customizable pre-made templates that users can "remix" with their own photos and text. New posts can also be created whole cloth based on photos taken from an iOS device's Photo Library, Camera, Lightroom and Creative Cloud. Post also features a powerful search tool for free domain images. Image hues can be dynamically changed with Design Filters, while "Magic Text" incorporates a comprehensive set of typography tools for text box modifications. Users have access to more than 35 font options, which can be arranged on the page by cycling through a few typesetting presets including alignment and line spacing. Adobe also offers a number of borders and background shapes to make text pop. Finally, an auto recolor tool lets users apply colors from hand-picked palettes to fonts, shapes and image filters. The stripped down toolset is sparse, but we were able to create the fairly professional-looking graphic above in less than a minute. Post relies on common iOS share sheets for posting to Instagram, Facebook, Twitter and other connected services. For now, Post is limited to a square canvas suitable for Instagram posting, but Adobe is working on alternative aspect ratios, Imbert said. Overall, Post is responsive, feature-rich, well designed and produces impressive results —everything one would expect from an Adobe "storytelling" title. Other apps in the series for casual creatives include Voice and Slate. Adobe Post is a free download from the iOS App Store.